Humphrey Spender said that he saw the sign at the back of the photograph and decided to wait to photograph until 3 smart girls came along. We are not sure of the location of this photograph. If you can help then please leave a comment below. 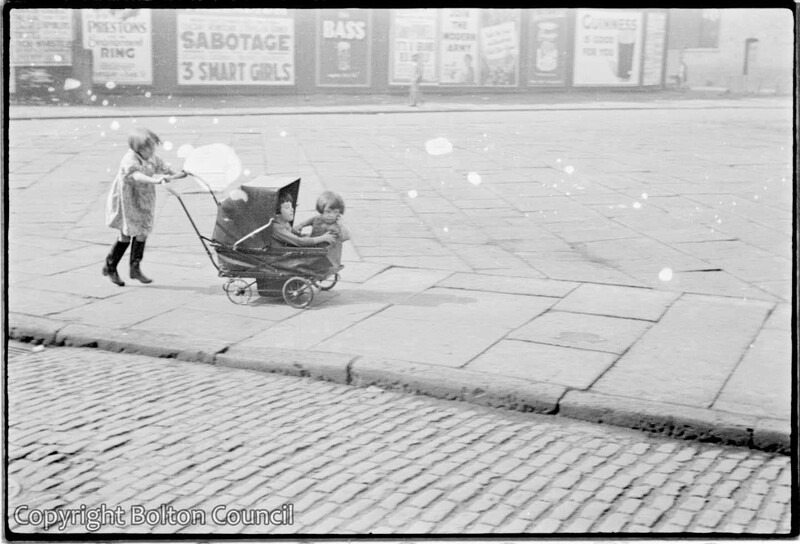 Having search for over a year to try and locate where this photograph was taken, I have still drawn a blank, having ruled out just about every junction of this shape in Bolton. Surely there is still somebody who is old enough to remember this scene who can put many of us out of our suspense. This is proving a real difficulty to identify. I have tried looking at maps all over town for the last couple of years but cannot place the photo. There must be somebody who recognises this or at least recognises a road of this shape, and can check it out against old maps and Google Street view to confirm or eliminate the location. Being taken in November (assuming the date is correct), this photo must be quite close to noon due to shadow length, so we must be looking in an approximate Westerly direction. A junction that fits this road layout perfectly was the original layout of the junction of School Hill and Duke Street, but I can find any decent photos to confirm this or to eliminate it, and I was never familiar with the area. Old maps show that there was a large triangle of what appears to be paved land here, so it does fit. Is there anyone from that area who can add anything to this? Having had significant further discussions with somebody who lived in this area at the time of the photograph, I can conclude that this is looking from East to West across Duke Street North and School Hill.